Jason Elliott checks a tattoo stencil before applying it to Cody Gambel's leg. With safety and health always in mind, Jason Elliot preps the chair where Cody Gambel will spend the next six hours. Jason Elliott shaves the last hair off Cody Gambel's leg before beginning the tattoo. 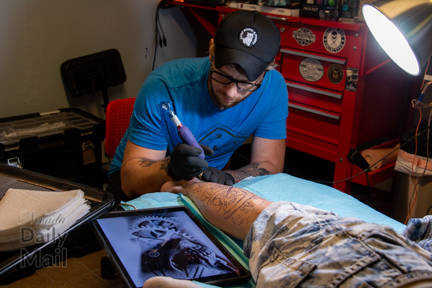 Jason Elliott applies a stencil to Cody Gambel's leg so that the tattoo will be as accurate depiction of the original artwork as possible. With the stencil in place and dry, Jason Elliott begins tattooing. After almost six hours, Jason Elliott is putting the finishing touches on Cody Elliott's tattoo. One more wash and a check to make sure no detail was missed. Cody Gambel's new tattoo by Jason Elliott. 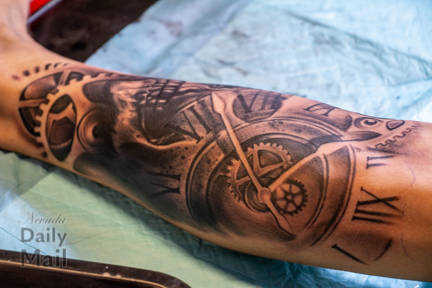 After right at six hours in the chair, Jason Elliott (left) finished Cody Gambel's left calf tattoo â€” a skull with clock works.